The sensor uses a full frame shutter (ShutterMode = "FrameShutter"), i.e. all pixels are reset at the same time and the exposure commences. It ends with the charge transfer of the voltage sampling. In free running mode, the sensor reaches its maximum frame rate. This is done by overlapping erase, exposure and readout phase. The sensor timing in free running mode is fixed, so there is no control when to start an acquisition. This mode is used with trigger mode Continuous. Snapshot mode starts with a trigger. This can be either a hardware or a software signal. Continuous Free running, no external trigger signal needed. OnDemand Image acquisition triggered by command (software trigger). OnLowLevel As long as trigger signal is Low camera acquires images with own timing. OnHighLevel As long as trigger signal is High camera acquires images with own timing. All pixels are light sensitive at the same period of time. The whole pixel core is reset simultaneously and after the exposure time all pixel values are sampled together on the storage node inside each pixel. The pixel core is read out line-by-line after exposure. Exposure and read out cycle is carry-out in serial; that causes that no exposure is possible during read out. The step width for the exposure time is 1 us. Image data is then shifted out line-by-line and transferred to memory. ProductFeatures This list has been created with driver version '2.32.0' and Firmware version '52'. This does NOT imply that all these features will only be available since these versions. They might be available in previous ones as well. Defines the transfer pixel format from the capture device into the host systems memory. This can differ from the pixel format delivered to the user application if needed. ImageRequestTimeout_ms 0 ms INT_MAX 1 ms - Defines the timeout for the request in ms. Once the timeout has elapsed the request object is returned to the user even if no data has been captured into it. The timespan taken into account for the measurement starts when the driver begins to capture data into this particular buffer! So when queuing 4 buffers with a timeout of 3000 ms each and no data being transmitted by the device will cause the last buffer to time out 3000*4 = 12000 ms AFTER the buffer has been queued and the acquisition has been started. A timeout of 0 never elapses. LowLight: Put camera in low light mode. EmbeddedImageInfo: Embed sensor specific info into the image readout buffer. ImageAverage: Calculate the average intensity value of the image and return as part of the request. PipelinedGainExposeControl: Enable pipelined Gain/Exposure control. OnDemandTriggerPreShot: Enable on demand trigger pre-shot option. LowFrameRateOptimization: Enable low frame rate optimization. EnablePerChannelOffsetCorrection: Enable per channel offset correction. UseRawSensorGain: Enable raw sensor gain. rolling shutter (ShutterMode = "ElectronicRollingShutter"). With the rolling shutter the lines are exposed for the same duration, but at a slightly different point in time. Moving objects together with a rolling shutter can cause a shear in moving objects. After the trigger pulse, the complete sensor array is erased. This takes some time, so there is a fix delay from about 285 us between the trigger pulse on digital input 0 and the start of exposure of the first line. The exact time of exposure start of each line (except the first line) depends on the exposure time and the position of the line. The exposure of a particular line N is finished when line N is ready for readout. Image data is read out line-by-line and transferred to memory (see: http://www.matrix-vision.com/tl_files/mv11/Glossary/art_rolling_shutter_en.pdf). The calculator returns the max. frame rate supported by the sensor. Please keep in mind that it will depend on the interface and the used image format if this frame rate can be transferred. ProductFeatures This list has been created with driver version '2.3.1' and Firmware version '49'. This does NOT imply that all these features will only be available since these versions. They might be available in previous ones as well. ImageRequestTimeout_ms 0 ms INT_MAX - - Defines the timeout for the request in ms. Once the timeout has elapsed the request object is returned to the user even if no data has been captured into it. A timeout of 0 never elapses. LowLight: Put camera in low light mode. EmbeddedImageInfo: Embed sensor specific info into the image readout buffer. ImageAverage: Calculate the average intensity value of the image and return as part of the request. The sensor uses a pipelined global snapshot shutter (ShutterMode = "FrameShutter") , i.e. light exposure takes place on all pixels in parallel, although subsequent readout is sequential. ProductFeatures This list has been created with driver version '2.3.2' and Firmware version '49'. This does NOT imply that all these features will only be available since these versions. They might be available in previous ones as well. ProductFeatures This list has been created with driver version '2.2.1' and Firmware version '49'. This does NOT imply that all these features will only be available since these versions. They might be available in previous ones as well. rolling shutter (ShutterMode = "ElectronicRollingShutter") With the rolling shutter the lines are exposed for the same duration, but at a slightly different point in time. An integer property storing the sub-address width of the I2C device to communicate with. Set to 0 for devices not supporting a sub-address. global reset release shutter (ShutterMode = "GlobalResetRelease"). This means, the bottom lines of the sensor will be exposed to light longer! For this reason, this mode will only make sense, if there is no extraneous light and the flash duration is shorter or equal to the exposure time. OnLowLevel Start an exposure of a frame as long as the trigger input is below the trigger threshold . OnHighLevel Start an exposure of a frame as long as the trigger input is above the trigger threshold. 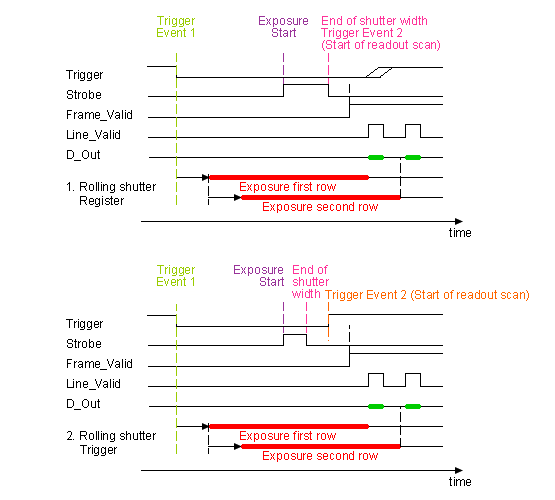 OnHighExpose Each rising edge of trigger signal acquires one image, exposure time corresponds to pulse width. In this case, DigOut0 gets a high signal as long as the exposure time (which is synchronized with the GlobalResetRelease). This signal can start a flash light. ProductFeatures This list has been created with driver version '2.5.10' and Firmware version '49'. This does NOT imply that all these features will only be available since these versions. They might be available in previous ones as well. ImageRequestTimeout_ms 0 ms INT_MAX 1 ms - Defines the timeout for the request in ms. Once the timeout has elapsed the request object is returned to the user even if no data has been captured into it. A timeout of 0 never elapses. LowLight: Put camera in low light mode. EmbeddedImageInfo: Embed sensor specific info into the image readout buffer. ImageAverage: Calculate the average intensity value of the image and return as part of the request. PipelinedGainExposeControl: Enable pipelined Gain/Exposure control. OnDemandTriggerPreShot: Enable on demand trigger preshot option. LowFrameRateOptimization: Enable low frame rate optimization. EnablePerChannelOffsetCorrection: Enable per channel offset correction. UseRawSensorGain: Enable raw sensor gain.